In her debut appearance at Couture Fashion Week, rising design star Ruchika Kabra will present her latest collection during the 25th season of the prestigious New York event. The fashion show will be held at 6:00 pm on Sunday February 12, 2017 in the Broadway Ballroom of the Crowne Plaza Times Square Manhattan, in the heart of the Big Apple. Ruchika Kabra is a graduate of the National Institute of Fashion Technology, India, where she was recognized with the Most Creative Collection Award in Textile Design. She has also studied fashion design at New York’s Parsons School of Design, and won an honorable mention for her evening wear collection while competing with 29 selected designers at the Fashion Institute of Technology (FIT) and Parsons. She also showcased her collection at the Stylepointe fashion show, a unique collaboration of fashion and dance, during NYFW 2016. Ms. Kabra’s design inspiration has always been the raw, imperfect beauty of handloomed silks and the fusion of western styles with ethnic fabrics, embroideries and the prints of India. Over the years, she has successfully taken forward the legacy set by her father in the field of Indian handloomed textiles. Silk fabrics have played a part in many civilizations throughout history. The special magic of silk stems from its interaction with light, which it refracts in a way similar to objects found in nature such as the iridescent mother-of-pearl interiors of a sea shell. Long before it is woven into cloth, silk is subjected to complex processing in order to preserve this luminous quality, this shimmer and brilliance. When light plays on a piece of silk, the weave appears, in turn, to glisten, glitter, change color, become moire’ lustrous or matte. Silk in its raw form is called ECRU. This ecru, combined with gold and silver threads, creates a magical fabric. A number of major weavers in India along the ancient Silk Road have restored the antique looms, thus contributing to the preservation of a priceless artisanal heritage. This textile art as applied to fashion occupies the major portion of Ruchika Kabra’s work. The design of silk clothing requires great aesthetic vision and sensitivity of perception because the pattern, cut and volume of a silk garment – whether worn by a man or woman – will condition the way its colors shimmer and shift in response to light and movement. 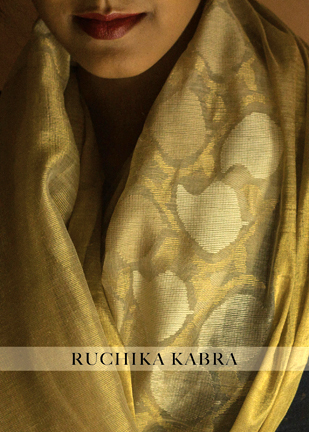 Ms. Kabra’s latest collection is all about silk used in its natural form. Beautiful crystals add a royal touch, and coordinate well with the sheen of silk. 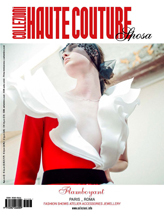 The collection of exclusive gowns to be shown at Couture Fashion Week is called “The Royal Ecru”, fit for a royal, cementing a fashion moment.